Steve Torrence got the Top Fuel win in hIs home state of Texas on Sunday. Fifty-one weeks after a grinding crash at The Plex arguably cost him the 2017 title, Torrence emerged as champion of the 33rd annual AAA Texas NHRA FallNationals. 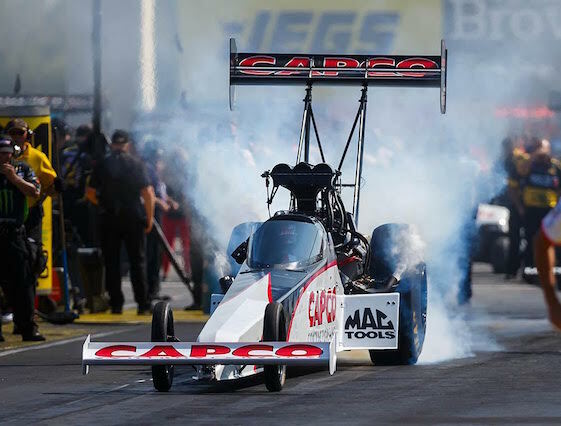 Torrence’s first Top Fuel victory on the famed all-concrete surface against Terry McMillen extended a streak that has seen the 35-year-old Kilgore resident win the opening three races of NHRA’s six-event Countdown to the Championship playoffs. In doing so, Torrence has won all 12 playoff rounds run to-date. Torrence has built a sizeable 103-point lead over second-place Clay Millican. That translates into five-plus rounds of racing (at 20 points per round). Torrence scored his eighth win of the season with a 1,000-foot pass in 3.786-seconds at 325.92 mph in his Torrence Racing dragster. McMillen _ who eliminated No. 1 qualifier Millican in the semifinals _ ran 3.826-seconds at 321.04 mph. His second-round crash at the Motorplex last Oct. 15 proved pivotal in preventing Torrence from becoming the first driver to win championships in NHRA’s Top Fuel and Top Alcohol Dragster divisions (2005). Robert Hight (Funny Car), Tanner Gray (Pro Stock) and LE Tonglet (Pro Stock Motorcycle) also emerged as winners in their respective categories of the Mello Yello Drag Racing Series Countdown. Torrence beat Bill Litton, Blake Alexander and eight-time world champion/Austin resident Tony “The Sarge” Schumacher to reach the final. McMillen defeated Mike Salinas, reigning world champion Brittany Force and Millican. In Funny Car, two-time/reigning world champion Hight scored his second consecutive Motorplex win and extended his lead to 50 points with a victory over J.R. Todd. Hight covered the 1,000-foot distance in 3.955-seconds at 325.69 mph in his Chevrolet Camaro SS for his second consecutive Countdown win, fourth of the season and 45th of his career. Todd, the point runner-up, ran 3.984-seconds at 319.52 mph in his Toyota Camry. Hight, of John Force Racing, was medically cleared to return to competition Thursday after suffering a broken collarbone when the engine in his car exploded shortly after crossing the finish line during his victory at Gateway Motorsports Park in Madison, Ill., on Sept. 23. A trip to a St. Louis-area hospital forced Hight to miss the Victory Circle celebration with his team and fans. Hight subsequently underwent surgery nine days before qualifying began Friday at The Plex. With a titanium plate keeping his collarbone together, Hight defeated Jim Campbell, Tim Wilkerson and Bob Tasca III en route to his 71st career final round. Todd, of Kalitta Motorsports, defeated John Hale, 2012 world champ “Fast” Jack Beckman and No. 1 qualifier Tommy Johnson Jr. on his way to his second final round of the Countdown. Teen-ager Gray continued his march to a first “Factory Hot Rod” world title with a victory over No. 1 qualifier Jeg Coughlin Jr. Gray, 19, earned his second consecutive Countdown win, seventh of the season and 12th of his two-year NHRA career with a quarter-mile pass in 6.622-seconds at 207.62 mph in his Chevrolet Camaro SS. Coughlin, a five-time world champ, ran 6.636-seconds at 207.83 mph in his Elite Motorsports Camaro. Gray now has an 89-point lead over Vincent Nobile. “We’ve been struggling with qualifying it seems like and for whatever reason we’ve been able to pull it out on Sunday,” said Gray, who began the day seventh on the 16-car ladder. “Some of it being luck and some of it just making good runs and beating the guy in the other lane. Today we got lucky for sure in the semis. I made a mistake (after Matt Hartford red-lighted at the start) and for whatever reason, I guess, I flinched and double-clutched it to ruin the run. Gray knocked off Deric Kramer, four-time world champ Greg Anderson and Hartford on a day he said personally graded-out as a B-plus. A resident of motorsports-centric Mooresville, N.C., Gray plans to “retire” from NHRA at season’s end to pursue a career in NASCAR beginning in 2019. Ideally, he will exit as an NHRA world champion. “That’s the only reason we’re here,” Gray said. Coughlin, who has 61 career Pro Stock wins, defeated Val Smeland, Drew Skillman and Vincent Nobile to climb to third in points, just one behind runnerup Nobile. Tonglet defeated teammate/team-owner Jerry Savoie to take the point lead in Pro Stock Motorcycle. Tonglet covered the quarter-mile in 6.892-seconds at 194.80 mph aboard his Nitro Fish Racing Suzuki to defeat Savoie, the 2016 world champ who ran 6.907-seconds at 193.88 mph on his White Alligator Racing Suzuki. Tonglet, the 2010 world champ, scored his fourth win of the season and has a 47-point lead over runnerup Eddie Krawiec, the four-time/reigning world champ aboard his Screamin’ Eagle Vance & Hines Harley-Davidson Street Rod. Matt Smith, who began the weekend with a 21-point lead over Tonglet, dropped to third aboard his Elite Motorsports Denso Auto Parts Buell EBR after an opening-round upset loss against Karen Stoffer and her Suzuki. Tonglet picked up round wins-against five-time world champion Andrew Hines, three-time champ Angelle Sampey and Krawiec en route to the final against bossman Savoie at White Alligator Racing. The Countdown will continue with the 11th annual NHRA Carolina Nationals at zMAX Dragway in Concord, N.C., Oct. 12-14. Top Fuel _ 1. Steve Torrence; 2. Terry McMillen; 3. Clay Millican; 4. Tony Schumacher; 5. Blake Alexander; 6. Antron Brown; 7. Leah Pritchett; 8. Brittany Force; 9. Richie Crampton; 10. Mike Salinas; 11. Doug Kalitta; 12. Scott Palmer; 13. Shawn Reed; 14. Kebin Kinsley; 15. Billy Torrence; 16. Bill Litton. Funny Car _ 1. Robert Hight; 2. J.R. Todd; 3. Tommy Johnson Jr.; 4. Bob Tasca III; 5. Tim Wilkerson; 6. John Force; 7. Cruz Pedregon; 8. Jack Beckman; 9. Courtney Force; 10. Ron Capps; 11. Matt Hagan; 12. Shawn Langdon; 13. Terry Haddock; 14. John Hale; 15. Jeff Diehl; 16. Jim Campbell. Pro Stock _1. Tanner Gray; 2. Jeg Coughlin Jr.; 3. Vincent Nobile; 4. Matt Hartford; 5. Drew Skillman; 6.Erica Enders; 7. Greg Anderson; 8. Kenny Delco; 9. Jason Line; 10. Alex Laughlin; 11. Deric Kramer; 12. Chris McGaha; 13. Bo Butner; 14. Fernando Cuadra; 15. Alan Prusiensky; 16. Val Smeland. Pro Stock Motorcycle _1. LE Tonglet; 2. Jerry Savoie; 3. Eddie Krawiec; 4. Steve Johnson; 5. Angelle Sampey; 6. Karen Stoffer; 7. Kelly Clontz; 8. Angie Smith; 9. Matt Smith; 10. Hector Arana; 11. Ryan Oehler; 12. Joey Gladstone; 13. Andrew Hines; 14. Anthony Vanetti; 15. Hector Arana Jr.; 16. Scotty Pollacheck. Top Fuel _ Steve Torrence, 3.786-seconds, 325.92 mph def. Terry McMillen, 3.826-seconds, 321.04 mph. Funny Car _ Robert Hight, Chevy Camaro, 3.955, 325.69 def. J.R. Todd, Toyota Camry, 3.984, 319.52. Pro Stock _ Tanner Gray, Chevy Camaro, 6.622, 207.62 def. Jeg Coughlin Jr., Camaro, 6.636, 207.82. Pro Stock Motorcycle _LE Tonglet, Suzuki, 6.892, 194.80 def. Jerry Savoie, Suzuki, 6.907, 193.88. Pro Modified _ Jeremy Ray, Chevy Corvette, 5.785, 248.07 def. Justin Bond, Pontiac Firebird, 5.774, 255.53. Top Alcohol Dragster _Joey Severance, 5.236, 273.55 def. Alan Bradshaw, 5.342, 270.00. Top Alcohol Funny Car _ Sean Bellemeur, Chevy Camaro, 5.504, 266.64 def. Doug Gordon, Camaro, 5.513, 265.43. Factory Stock Showdown _ Leah Pritchett, Dodge Challenger, 8.106, 169.02 def. Kevin Skinner, Ford Mustang, 9.697, 101.72. FINAL _ S. Torrence, 3.786, 325.92 def. McMillen, 3.826, 321.04. FINAL _Hight, 3.955, 325.69 def. Todd, 3.984, 319.52. FINAL _ Gray, 6.622, 207.62 def. Coughlin, 6.636, 207.82. FINAL _ Tonglet, 6.892, 194.80 def. Savoie, 6.907, 193.88. Top Fuel _1. Steve Torrence, 2,468; 2. Clay Millican, 2,365; 3. Tony Schumacher, 2,303; 4. Leah Pritchett, 2,244; 5. Antron Brown, 2,221; 6. Terry McMillen, 2,189; 7. Doug Kalitta, 2,169; 8. Mike Salinas, 2,150; 9. Brittany Force, 2,140; 10. Scott Palmer, 2,117. Funny Car _1. Robert Hight, 2,387; 2. J.R. Todd, 2,337; 3. Tim Wilkerson, 2,254; 4. Tommy Johnson Jr., 2,251; 5. Courtney Force, 2,232; 6. Ron Capps, 2,215; 7. Matt Hagan, 2,175; 8. Jack Beckman, 2,172; 9. John Force, 2,168; 10. Shawn Langdon, 2,120. Pro Stock _1. Tanner Gray, 2,409; 2. Vincent Nobile, 2,320; 3. Jeg Coughlin Jr., 2,319; 4. Drew Skillman, 2,275; 5. Greg Anderson, 2,266; 6. Erica Enders, 2,251; 7. Jason Line, 2,175; 8. Bo Butner, 2,154; 9. Deric Kramer, 2,136; 10. Chris McGaha, 2,096. Pro Stock Motorcycle _1. LE Tonglet, 2,356; 2. Eddie Krawiec, 2,309; 3. Matt Smith, 2,308; 4. Hector Arana Jr., 2,253; 5. Jerry Savoie, 2,247; 6. Andrew Hines, 2,233; 7. Steve Johnson, 2,183; 8. Angie Smith, 2,168; 9. Angelle Sampey, 2,143; 10. Scotty Pollacheck, 2,125. Jeremy Ray earned his first career victory during the E3 Spark Plugs NHRA Pro Mod Drag Racing Series presented by J&A Service portion of the AAA Texas NHRA FallNationals. The weekend’s Pro Mod racing, presented by Bruce Lowrie Chevrolet in Fort Worth, was the 10th of 12 races this season. Ray won on a hole shot with a quarter-mile pass of 5.785-seconds at 248.07 mph in his 1963 Chevy Corvette against Justin Bond’s 5.774 at 255.53 in his 1967 Pontiac Firebird. Ray defeated Steve Jackson, Steven Whitelely and No. 1 qualifier Sidnei Frigo to advance to the finals. Pro Mod Drag Racing will continue at the 11th annual NHRA Carolina Nationals on Oct. 12-14 at zMAX Dragway in Concord, N.C. Pro Modified _ 1. Jeremy Ray; 2. Justin Bond; 3. Sidnei Frigo; 4. Todd Tutterow; 5. Mike Castellana; 6. Rickie Smith; 7. Rick Hord; 8. Steven Whiteley; 9. Chad Green; 10. Michael Biehle; 11. Mike Janis; 12. Jader Krolow; 13. Danny Rowe; 14. Keith Haney; 15. Steve Jackson; 16. Khalid alBalooshi. FINAL _Ray, 5.785, 248.07 def. Bond, 5.774, 255.53. Pro Modified _1. Mike Janis, 683; 2. Rickie Smith, 658; 3. Steve Jackson, 595; 4. Mike Castellana, 593; 5. Chad Green, 546; 6. Khalid alBalooshi, 517; 7. Jeremy Ray, 497; 8. Jose Gonzalez, 435; 9. Todd Tutterow, 433; 10. Danny Rowe, 380.